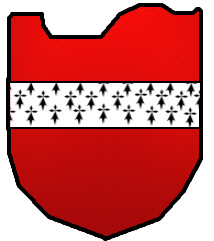 Coat of Arms: A red shield with an ermine fess. Crest: A red deer's head. Motto: Tutum et robore reddam. Motto Translated: I will make thee safe by my strength. The youngest son of the 4th Earl of Richmond (who was descended from the Duke of Brittany) was granted lands in the Barony of Craufurd (from "crow ford") in Lanarkshire in the 12th century by King David I and the family took the surname from the placename. The youngest son of the 4th Earl of Richmond (who was descended from the Duke of Brittany) was granted lands in the Barony of Craufurd (from "crow ford") in Lanarkshire in the 12th century by King David I and the family took the surname from the placename. In 1127 Sir Gregan Crawford was involved in the legendary incident when King David was saved from a stag (and founded the Abbey of Holyrood as a result). In 1296 Sir Reginald Crawford was appointed sheriff of Ayr. His sister married Wallace of Elderslie and thus became the mother of William Wallace the great Scottish patriot. Needless to say, the Crawfords rallied to his cause. The main branches of the family were Crawford of Auchinames (in Renfrewshire) who received a grant of land from Robert the BruceRobert the Bruce and Craufurd of Craufurdland (in upper Clydesdale). Sir William Craufurd of Craufurdland was a brave soldier who was knighted by King James I and fought for King Charles VII of France. The castle at Craufurdland was much extended in the 17th century. The castle passed to the Howiesons in 1793 and was restored in the 1980s. Other lines of Crawfords began in the reign of James III when descendants of Archibald Craufurd created the families of Auchenairn, Beanscroft and Powmill. Archibald's son John was killed at the Battle of Flodden in 1513. In the 16th century, Thomas Crawford of Jordanhill was a member of the household of Lord Darnley, husband of Mary Queen of Scots. During those turbulent times he captured Dumbarton Castle in 1571 with 150 men by scaling the supposedly impregnable rock and later received the surrender of Edinburgh Castle. Lawrence Crawford (1611-45) fought for Gustavus Adolphus in the Thirty Years War and returned to Britain to fight for the Parliamentary forces against King Charles I. 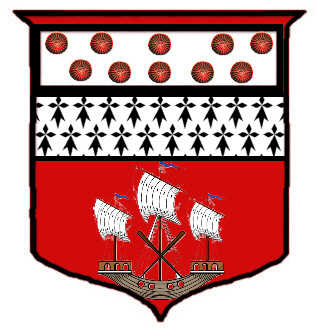 The Crawford clan motto is "Tutum te robore reddam" which means "I will give you safety by strength". Crawford was the 75th most frequent surname at the General Register Office in 1995. Gules. Red. ln engraving is represented by perpendicular lines, and is expressed sometimes in Blazon by the precious stone Ruby, or the planet Mars, etc. CREST: A Stags head proper between the horns a cross crosslet. Motto : Omnia Deo juvante. I can do all things with God's help. Rererence Papworth . page 718. In our book of Scotland and her tartans this is also written. Crawfurd [ d 1248] had two daughters . From the younger who married David Linsay, are decended the Earls of Crawford. Sheriff of Ayr was treacherously murdered by the Englishat a banquet in his home town in 1297. His sister Margaret married Sir Malcolm Wallace of Elderslie, and their son Sir William Wallace [ 1274 - 1305 ] was the famous Scotish patriot and warrier. [ Film Brave Heart ]. The Crawfurds of Auchinamesare decended from a brother of Sir Archibald , and got their Estate from King Robert 1 [ the Bruce]in 1320. 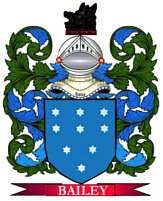 A third branch of the family acquired Kilburnie in 1499. In 1781 a baronetcy was conferred on Alexander Craufurd of Kilbirnie , who had three distinguished sons : Sir James Craufurd , British Ambassador in Hamburg [1798 - 1803]; Lieut - General Sir Charles Gregan Craufurd[ 1761 - 1821], who served with great courage and daring in the Netherlands in 1794; and Major - General Robert Craufurd [ 1764 - 1812 ], commander of the Light Brigade in the Peninsular War.